Carnarvon Gorge is a paradise carved from the rugged sandstone range by the passage of water and time. The spectacular gorge carries special significance in Aboriginal mythology and is equally important as an historic geological landmark. Vast rock formations hold fast their secret memories of ancient tribal gatherings. Stencil art, images and symbols of the Aboriginal Dreamtime adorn the various walls in the Gorge. 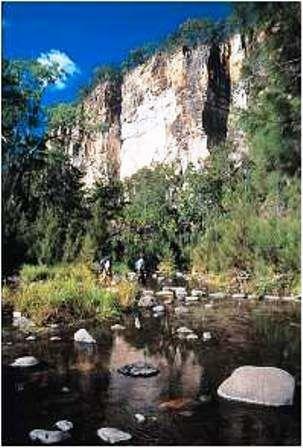 Carnarvon Gorge is the most visited section of the expansive 298,000 hectare Carnarvon National Park. 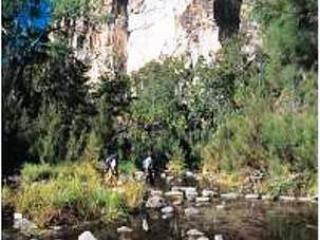 The inaccessible Consuelo Tableland and Great Dividing Range provide a spectacular backdrop to the Gorge. Visitors generally stay at least three nights to explore the 21km of graded walking tracks, explore the side gorges and view Aboriginal art sites. The Park is a bird watchers sanctuary with more than 183 bird species recorded. Take an early morning stroll along the Nature Trail and spot platypus diving in the sculptured pools of Carnarvon Creek. An evening walk with a torch may reveal possums, gliders, bandicoots and kangaroos. Hundreds of plant species crowd the fertile gorge which still shelters giant Angiopteris ferns dating back 300 million years. Palms and Cycads, Grass-tress and Eucalyptus, and an abundance of mosses, lichens and other small plants can be found. Cathedral Cave is one of the most extensive Aboriginal Art Sites within the Gorge. Other locations include Baloon Cave, just a 500m walk from the Lodge, or a half-day walk to the Art Gallery. Stencils, engraving and freehand drawings adorn the soft sandstone and rock overhangs. Many short walks from the main gorge track lead to beautiful side gorges and waterfalls. Half day walks will lead to unique sites such as the Moss Garden, Amphitheatre and Ward's Canyon. The Moss Garden is a world of its own. A natural spring constantly pours forth water which, slowly filtering through the sandstone, leaves the rock surface with a myriad of tiny droplets. A carpet of green moss and a magic waterfall looking up into the accessible Violet Gorge make this spot an essential place to visit. The Amphitheatre is a site which simply must be seen to be believed. Inside the ancient rock wall, hidden behind a narrow crack, millions of years have produced an incredible crevice in which you will feel dwarfed by majesty. It will lift your spirits as well as your voice as the Amphitheatre is well known for its remarkable acoustics. Entering Ward's Canyon you will immediately notice a dramatic drop in temperature. Like stepping into another time you will be surrounded by ancient King Ferns (Angiopteris), the largest fern in the world. There is also the rare moment of sunlight playing on the hidden Aljon Falls, which only happens for about five minutes every day. We recommend you take sturdy shoes, hat and sunscreen. A good tip is to take binoculars and camera for the viewing and recording of the park's wildlife and scenery. A comprehensive bushwalking map and guide is available from the lodge. It details over a dozen walks, which will take you into the depths of the park, and offer hours of wonderful exploration. Ranging from a short turn around the Lodge to full day excursions, these walks will reveal everything this unique region has to offer. 'When walking in Carnarvon Gorge National Park, remember that the walk along the way can offer you as much enjoyment as the destination. You'll miss a great deal if you just put your head down and plod along the track. Take the time to sit on a rock or a log by the creek "and let the park come to you". Pause to enjoy the sights, sounds and scents of the bush, and you'll come back refreshed and recreated'.